How to fix the error "DV002: The Dashboard Service could not be contacted. There may be a temporary glitch or the server may be down"? Dashboard Server shows the error “DV002: The Dashboard Service could not be contacted. There may be a temporary glitch or the server may be down.” Due to one of the following reasons. SSL configuration is not done in the Dashboard Service when it is done in the Dashboard Server. SSL is not enabled in the Dashboard Server Settings when it is configured in the IIS for the Dashboard Server. Site URL is not updated in the Dashboard Server Settings when the binding is already changed in the IIS. 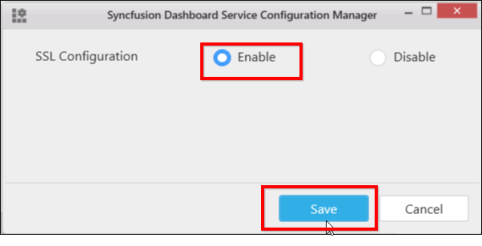 Run the “SyncfusionDashboardServiceConfigurationManager.exe” utility and enable the “SSL Configuration” and save it. 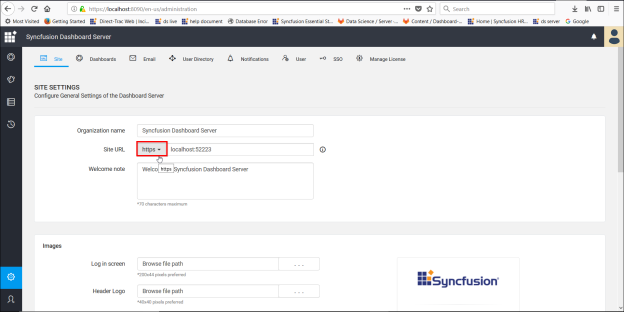 Go to “Settings” page in Syncfusion Dashboard Server and change the Site URL with “https” as shown below and save it. If you have added/edited the binding in IIS, you must update binding URL in Site URL in Dashboard Server Settings. Go to “Settings” in Syncfusion Dashboard Server and update the Site URL as shown below and save it. Now, open the dashboard to view it without any errors. If you still have issues viewing the dashboard, check our Knowledge Base for more articles or create a support incident. Not able still connect to server.if i don't used ssl certificate. Have you checked whether the binding URL is updated in the Site URL of the Dashboard Server settings page as mentioned in the 3rd point(Site URL is not updated in the Dashboard Server Settings when the binding is already changed in the IIS) ?